I recently posted my feelings and concerns about the new Pokémon Go mobile game. As I said, I've been a fan of the Pokémon franchise since the mid to late 90's and I often just pick up the games when I have free time. However, recently I found my old DS (the original metalic pale blue one) was coming to the end of its life - the buttons sometimes have dead spots and the case is completely worn out. When I lose that I will also lose my only way to play the old GameBoy Advance games I have (Fire Red, Sapphire and Emerald) and as such I'll probably be unable to play any of my Pokémon games. I could just buy a new (well, used) DS on eBay, but I thought I'd bring my games to the modern era, whilst also removing the need to carry separate devices and carts around with me - with emulation. Now, it is important to note that emulation requires ROMs and a BIOS from the devices and carts that contain the game. Depending on where you're from this is in varying levels of legality. A while ago (a number of years) I dumped my GBA games (Fire Red, Sapphire, Emerald), my DS games (Pearl, Heart Gold, Mystery Dungeon) and my DS BIOS using an R4 card (which have since been ruled as illegal in the UK) and thankfully I'm a hoarder and still have the ROMs on my PC. So I've been emulating those games to varying degrees for a while now. However, recently I stumbled back upon a great community project - PokéMMO. PokéMMO combines the original stories, sprites, music, and sound effects from the ROMs with a unique online experience. From the very start of the game you are presented with a much improved character creation screen, allowing you customise your character as seen in games like Terraria. You also get to choose starting location (Kanto or Hoenn at this point). This isn't a final decision though, you can simply take a ship to the other region once you progress far enough in the game! As soon as you drop into the game you notice the difference (other than that it takes up your whole screen) - the players. You get the usual Pokémon start, you can't leave the town (Pallet town in the Kanto region) until you've got your starter - Charmander, Squirtle, or Bulbasaur for Kanto. You do the same starting quest, getting a parcel for Professor Oak. It really brings back the nostalgic feelings. You can play almost the entire game as it was in the originals, with the same dialogue and quests. But you can also take advantage of the many of the extra features PokéMMO adds, from social features like teams and direct trading with players in the world, to global trading where you can buy or sell Pokémon on an open market to thousands of other players. It even adds a direct, global, tournament system where you can battle any player in the game at any time. For those who are fond of breeding you can breed Pokémon (albeit in a way that is a little different to the vanilla games) for better IV stats. 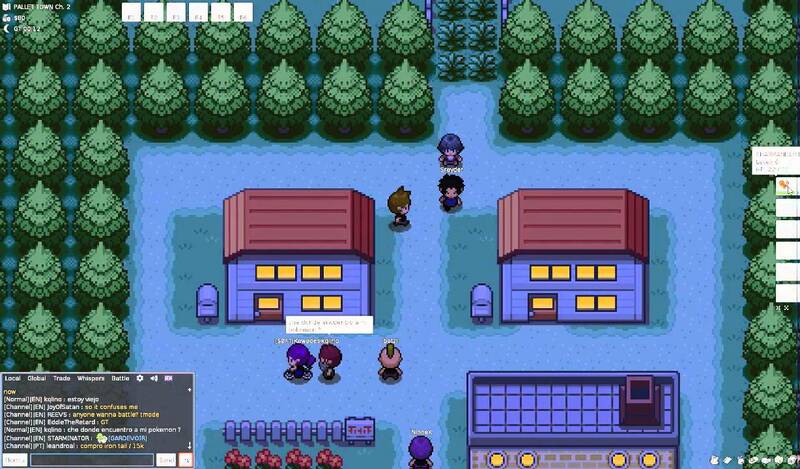 Overall PokéMMO brings the great concepts of Pokémon games from the past into a modern MMO style setting. It's a great addition for anyone who wants to play Pokémon online with friends. Notice: I do not condone or suggest anyone reading this downloads ROMs to play in an emulator or in PokéMMO. Always check the legality of dumping ROMs in the region you live, and never pirate the games!